I spent the lion's share (or perhaps I should say the bear's share...we'll get to that in a minute) of this past Friday listening to a series of talks on rethinking how to think about postwar Japan. And then the remainder of the day and much of the night was spent thinking about what people thought about rethinking those thoughts about thought. Perhaps unsurprisingly, this was, while undoubtedly and eminently salubrious, also pretty exhausting. When I finally stumbled off the train at nearly midnight after some heated discussion and cold beers, I needed renewal...I needed ramen. 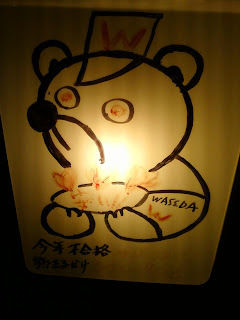 Fortunately, Kuma Bokko, located just east of Takadanobaba station on Waseda-dôri is open no less than 24 hours a day. It looks as if it's been around for many of those 24 hour cycles, and it's another old school neighborhood cafeteria style ramen joint that has probably been serving cheap bowls of noodles for decades. Kuma Bokko means something like "the naive little bear," which is most likely a reference to the neighborhood's Waseda students, since the school mascot is the Bear. 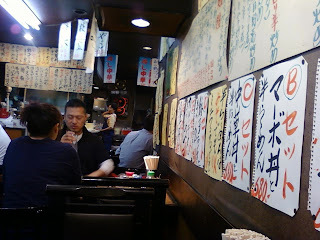 But weirdly (or not), there wasn't a single student-esque type in the joint, which was packed with salarymen who had the same thought i did - "whooo, I am drunk and tired, I need to eat CHEAP HOT FOOD NOW." I didn't have my camera, but somehow taking the pics with my cellphone seemed appropriate. Cheap food is definitely Kuma Bokko's selling point - nary a menu item broaches the five-hundred yen (about $5) mark, so for a single coin you can fill your belly with some old school ramen. The menu is tossed up on scraps of paper all over the walls, so if you crane your neck around you get a sense of what's on offer - namely most every major ramen varietal and then some, including old school favorites like Tanmen (thin salty soup with veggies), Gomoku Soba (thick salty soup with different veggies), and my personal poison for the evening Mabo Tofu Soba ("Sichuanese style" tofu poured on top of ramen). There's also a wide selection of old-fashioned Japanese-Chinese style stir fries, featuring plenty of pork, peppers, liver, leeks, and eggplant. Overall, it's a similar kind of menu to Ramen Jumbo down the block. If Kuma Bokko's menu is loosely based on Chinese dishes, the shop itself probably feels a bit "Chinese" too; that is to say, there's an old lady staked out in a corner chopping a mountain of cabbage and plenty of flies in the bathroom. That's right, Kuma Bokko is officially a dive - I haven't seen this many people passed out sitting up since my last visit to the Mars Bar in New York. At least Kuma Bokko smells like garlic, steam, and soy, rather than stale pee. 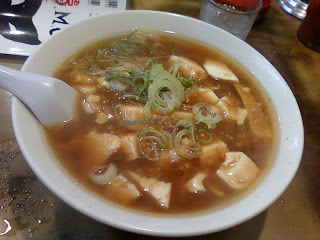 When my bowl arrived it was piping hot, which was rejuvenating, as was the thin salty soup. Japanese mabo tofu shares little with the Sichuanese mapo doufu from whence it came, and rather than being draped in a pungent spicy and numbing oil, Kuma Bokko's mabo tofu sits in a thickish sweetish goo that had permeated the bowl to the point where I could no longer tell if it had originally been a shio (salt) or shôyû (soy) base. No matter. This is not the stuff culinary dreams are made of, but it is what the body craves when you're tired. I don't think I can recommend Kuma Bokko's ramen as such, but I will say that all the drunk office workers and fighting couples sitting around me know what's up for late night dining. As with most run-down neighborhood Chinese-food places, the noodles were medium thin, on the soft and flimsy side and mildly curly. The only toppings besides the (truly impressive) pile of tofu were a smattering of scallions and a few optional dabs of garlic and chili paste. Kuma Bokko is not the place you want to go to have a nice lunch, but I think its staff and clientele all know that, so it's all good. Plenty of hot salty food for not so much money is rarely a bad thing. It's almost worth going just to check out the scene. Just be sure you've already missed the last train. I love this blog. The reviews are great. 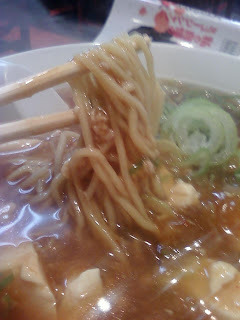 I used to live in KISHIBOJIN and I love the area, lots of great ramen. glad you like it! it's been a bit slow recently since i've been out of town, but i have a whole slew of new posts coming up, so stay tuned! and yeah, i really like kishibojin, it's got a nice atmosphere to it, especially the shrine area. though i must confess i've never had any ramen there, any recommendations? 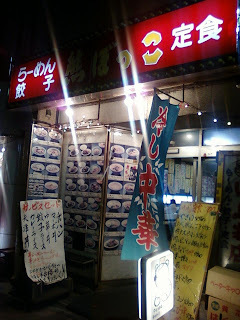 The ramen shops I was referring to are down near takadanobaba. There's one below the Crossroads bar, with a bone hanging outside the shop. Right next to the river, down the street from the Indian take out place. I already told you about the tsukemen next to the shrine. That place was good. Right, right I still gotta go check out that tsukemen place, though I don't do tsukemen that often. The place with the bone has gotta be part of the Ganko Ichijoryu family...definitely wanna check that out! Thanks!